Christmas is coming, and Carlos and his family are going home—driving south across the border to Mexico. But Mexico doesn't seem like home to Carlos, even though he and his sisters were born there. Can home be a place you don't really remember? This dazzling picture book was written and illustrated by Eve Bunting and David Diaz, the Caldecott Medal-winning team behind Smoky Night. At first, La Perla doesn't seem very different from the other villages they pass through. But then Carlos is swept into the festivities by Grandfather, Aunt Ana, and the whole village. Finally, Carlos begins to understand Mama and Papa's love for the place they left behind and realizes that home can be anywhere, because it stays in the hearts of the people who love you. Glowing with holiday joy and the spirit of Mexico, this is a must-have for any home or library collection. 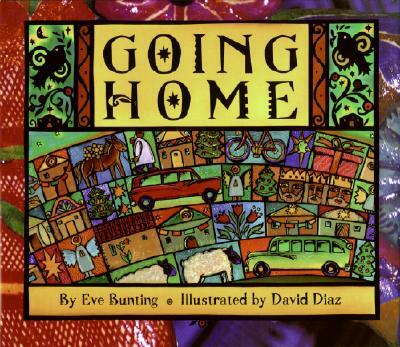 David Diaz has illustrated numerous award-winning books for children, including smoky night by Eve Bunting, for which he was awarded the Caldecott Medal; The Wanderer by Sharon Creech, which received a Newbery Honor; and Me, Frida by Amy Novesky, a Pura Belpré Honor Award winner. Mr. Diaz lives in Southern California.